Design work is underway to downsize the 1500 MW ESBWR to a 300 MW model to be called the BWRX300. As yet no date has been set for submitting it for design safety review at the NRC. GE-Hitachi (GEH) is focusing its design work on getting the cost of the reactor down from the levels associated with full size reactors like the ESBWR. Using a global average of $5,000/KW, the 300 MW unit would cost $1.5 billion. The company’s goal is to reduce the cost of the SMR to the point where it can compete with natural gas plants. Representatives of the company, told a Wilmington, NC, newspaper in April, that it plans to eventually offer a 300 MW small modular reactor at a highly competitive price tag of $700M or $2250/Kw. That price would be achieved once volume production was taking place a company representative said. A presentation to a nuclear trade conference in April cited a cost of “60% lower than the ESBWR.” A 1500 MW ESBWR unit at $5000/KW would cost would cost $7.5 billion. A 60% lower price would be $3 billion. Given the distance between the promoted price of $700 million and “a 60% cost savings,” it may be that some clarification is needed by the firm on it statements about pricing. Also, it’s not possible to confirm that either the newspaper or the trade show reports got their numbers right. 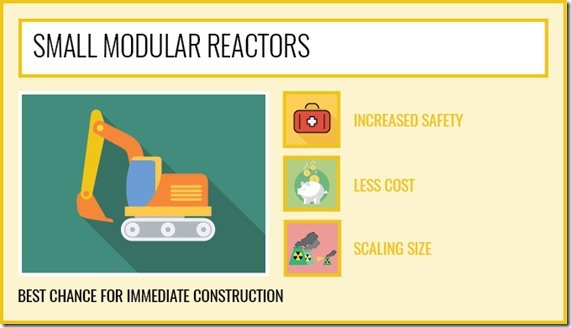 Using the NuScale number for a 300 MW reactor, the cost would come in at $1.52 billion. Some of this is an apples v. oranges comparison since the price differences need to take into account design factors such as steam generation equipment and size of the unit. Nuclear Energy Insider did not report a LCOE for the GE-Hitachi unit. At the trade conference Eric Loewen, (right) speaking for GE Hitachi, said further price reductions for the BWRX300 would be possible once the firm had a large number of orders. “Once you start having numbers greater than 10, then you have different conversations with your suppliers,” he said. The last time any nuclear utility and vendor offered a price to build new nuclear power plants at a cost approaching that number was in 2007 when NRG promoted its twin ABWRs for the South Texas Project Units 3 & 4 at $2700/KW. Even at that price NRG could not attract investors from Texas municipal power systems. In particular, the City of San Antonio, TX, spooked by the prospects of cost overruns and resulting rate increases, walked away from a commitment to the project. In Austin, TX, the effort led by an anti-nuclear chief of the municipal electric utility, was the final blow to the project. According to the presentation summary posted by Nuclear Energy Insider, cost savings factors for the GEH 300 MW SMR include the cooling system which will rely on natural circulation systems and passive safety systems. The light water reactor design would sit in an underground silo [containment] at a customer site. GE Hitachi also is promoting a much smaller staffing profile for the 300 MW SMR. It told Nuclear Energy Insider that it would take just 75 people to run the reactor. Using an industry average of 0.7 full time equivalent (FTE) per 1MW, a 300 MW unit would require 210 FTE. A staff of 75 FTE would be a nearly two-thirds’ reduction in labor and related O&M costs. So far the firm has not published a public facing web page with additional technical information about the 300 MW SMR. As for a licensing path forward, GEH says the work it has done on the ESBWR will facilitate it. Scaling a reactor up in size like Westinghouse did from 600 MW to the 1150 MW of the AP1000 meant that everything got bigger. In this case, everything will get smaller. Components will change, and so will suppliers, with changes of this magnitude. The GEH design at 300 MW is one of the largest announced as being under development in the U.S. Previous efforts by other firms to develop SMRs of this size have included the BWXT mPower SMR which has a design that includes two 180 MW reactors at a single installation. After ending joint design and licensing effort with TVA, BWXT briefly partnered with Bechtel to develop a US market, but it ended that deal in March 2017. Westinghouse was at one time developing a 225 MW SMR but ended its efforts in early 2014 due to the lack of customers in the U.S. In September 2017 Westinghouse said it was working to develop its SMR for the UK market. The firm has a nuclear fuel fabrication facility in Lancanshire which would support this effort. The 330 MW GEH PRISM is not considered to be an SMR both due to its size, and its specialized nature which is to burn surplus plutonium (PU-239). GEH has been talking to the UK’s National Decommissioning Authority to develop an opportunity to use it there. In June 2017 GEH said it would seek an NRC Part 50 license for the PRISM reactor. The cooperation will initially focus on nuclear fuel development supported by GNF and control rod drive mechanisms designed by GEH, and may later extend to other areas. Holtec plans to design, license, commercialize, deploy and service the SMR globally. ARC-100 – In September 2017 GE Hitachi Nuclear Energy (GEH) and Advanced Reactor Concepts (ARC) have signed an agreement for ARC to license technology from GEH’s Prism advanced reactor design as part of their joint effort to develop and deploy a sodium fast reactor in Canada. The US-based companies said in a joint statement that GEH has also agreed to provide ARC access to nuclear infrastructure programs related to quality, safety culture, training, processes, procedures and tools. In addition, GEH said it will make an “in-kind contribution” to ARC through its agreement to provide engineering and design expertise. The companies previously announced in March 2017 that they would collaborate on the ARC-100 design with initial deployment in Canada. They have begun work on a preliminary regulatory review of the ARC-100 by the Canadian Nuclear Safety Commission. A joint GEH-ARC engineering team is working to advance the ARC-100 design. GEH and ARC have each developed advanced reactor designs based on the EBR-II, an integral sodium-cooled fast reactor prototype which was developed by Argonne National Laboratory and operated for more than 30 years at Idaho Falls, Idaho. (NucNet) GE Hitachi Nuclear Energy (GEH) announced 5/20/18 that Dominion Energy will provide funding for the project to develop and commercialize the BWRX-300, a 300-MW small modular reactor design being developed by GEH. GEH said Dominion Energy’s funding provides seed money for work that could lead to commercialising the BWRX-300. GEH did not say how much funding Dominion had agreed to provide. “We believe that nuclear power has a vital role in ensuring a clean, reliable, and cost-effective supply of electricity to meet the needs of a growing economy,” said Dan Stoddard, Dominion Energy’s chief nuclear officer. “We also believe the innovations GE Hitachi is pursuing with the BWRX-300 SMR have the potential to make it a strong competitor in the marketplace. Dominion Energy said it has “no plan at this time” to build a BWRX-300 at any of its commercial nuclear stations. Dominion Energy operates a total of six nuclear units at the Millstone, North Anna and Surry nuclear stations. It has received a license from the NRC for the North Anna III unit, but has not moved forward with plans to build it. Significantly, the reference design for the COL is a full size GEH ESBWR. GEH said the BWRX-300 makes use of the design and licensing basis of the ESBWR. (Economic Simplified Boiling Water Reactor), which has been certified by the US regulator. GEH believes the BWRX-300 will require up to 60% less capital cost per MW when compared to other water-cooled SMRs or existing large nuclear designs. Dominion’s move is the latest in a series of U.S. utilities signing on for the next generation of nuclear reactor designs. UAMPS has made a commitment to be a customer for the FOAK NuScale 50 MW SMR. Separately, Southern has inked a development agreement with X-Energy to develop a pebble bed HTGR. Southern also has a development agreement with GEH to work on the PRISM reactors design. (Reuters) The French nuclear industry is considering developing Small Modular Reactors (SMRs). In addition to achieving technical excellence, EDF-owned Framatome, formerly called Areva, told the wire service a key focus is on cost. It is conducting design work on small 150-to-170-MW reactors with state nuclear agency CEA. CEA head of nuclear energy François Gauché said the agency said the current design phase will address technical and financial feasibility of SMRs over the next 18 months. Philippe Knoche, chief executive of French nuclear fuel group Orano, said factory production – as opposed to construction on-site for big reactors – could lower the cost of SMRs, making them competitive if manufacturers built dozens. This number, “dozens,” is much larger than some estimates that significant cost savings could be achieved after production of as few as 10 units. After inking an agreement with X-Energy last November to look at the potential deployment of X-energy’s Xe-100 high temperature gas-cooled pebble bed modular reactor in Jordan, that country has also opened talks with China National Nuclear Corp. (CNNC) to investigate the potential for a 210 MW HTGR which also uses a pebble bed design. Note that the power rating for the Chinese design has also been reported to be 220 MW and 250 MW. According to a financial wire service report, the Jordan Atomic Energy Commission (JAEC) is holding talks with CNNC for a first of a kind unit that could cost $1 billion. If ground were to be broken next year, the agency said the power station could be in revenue service as early as 2025. China’s State Nuclear Power Technology Corp. (SNPTC) completed the installation of its high-temperature gas-cooled reactor (HTGR) project in November 2017. Work began in 2012. The reactor uses helium as a coolant instead of water. After the helium is heated to 750C (1,382F), it is sent to a steam generator where it heats water until it becomes high-temperature steam. SNPTC’s design, which consists of two high-temperature reactor pebble-bed modules that drive a single turbine to produce 210 MW, is located in Shandong province. The units are expected to go into commercial operation this year. According to the wire service report, Khaled Toukan, head of the JAEC, said the HTGR, could also be used for water desalinization, for process heat, and would be abl to service oil refineries and related chemical industries. In the water short country, nuclear reactors that use helium for cooling and heat transfer, would be at a competitive advantage over conventional PWRs. This may be another reason, in addition to costs, that Jordan has not moved forward with a plan to acquire two 1000 MW VVER from Rosatom. In the Middle East so far all plans for HTGRs, in Saudi Arabia and Jordan, are for coastal sites. Sea water in a third loop will be used to cool the secondary closed loop steam exhaust from the turbines to return the water to the steam generator. Also, with a co-located desalinization plant, the reactor can supply the fresh water for is own steam system. In May 2017 Saudi Arabia and China held their first meeting to discuss the feasibility of constructing high-temperature gas-cooled reactors (HTGRs). But the steam power conversion requires the same heat rejection cooling as any thermal plant. Like ThorCon the high temp means better efficiency and less cooling than lower temp PWR, but water cooling is likely required. Rare reactors like THTR-300 were air cooled. In the Middle East so far all plans for HTGRs, in Saudi Arabia and Jordan, are for coastal sites. Sea water in a third loop will be used to cool the secondary closed loop steam exhaust from the turbines to return the water to the steam generator. For this reason, consumptive use is the volume of the secondary loop pipes plus 5% consumptive use from steam loss in the turbines. This is far less than a once through fresh water steam system for steam generation. Also, with a co-located desalinization plant, the reactor can supply fresh water for is own steam system.